German soldiers visiting the Soviet T-35 multi-turret tank abandoned on the street Lviv from Grodek (Lviv region, Lviv street – a stretch of road Przemysl-Lviv). This tank from the 67th armored regiment of the 34th Tank Division of the 8th Mechanized Corps of the South-Western Front. T-35 multi-turret tank release in 1939 with conical turrets and direct under the turret box, released 7 of tanks (air-744-61 at 744-67 inclusive). 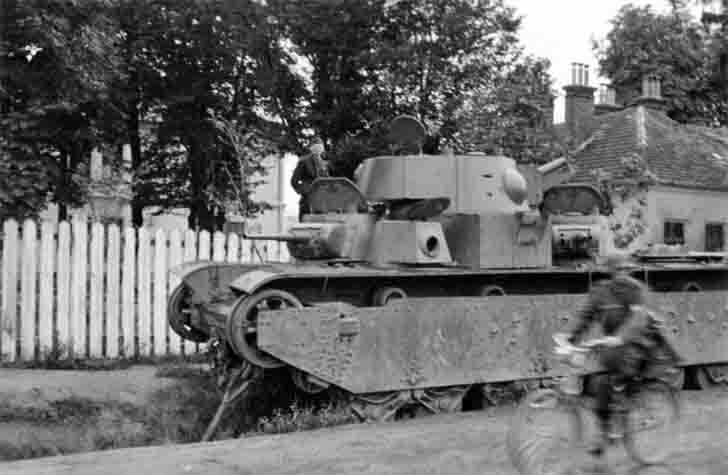 This T-35 multi-turret tank has a serial number 744-62. With direct under the turret box it was released in all 3 tanks. The commander of the T-35 multi-turret tank – Taranenko.